The La Caixa Foundation in Barcelona has one of the most important collections of contemporary art in Europe. More than 800 exhibits outstanding artists such as Beuys, Anish Kapoor, Tony Cragg or Juan Uslé are in the Museum of the CaixaForum Barcelona. The CaixaForum is a part of the cultural and social commitment of the Caixa. The museum opened in 2002 and is located in the individual restored clothing factory Casa Casarramona. The construction at the foot of Montjuic was designed by Catalan architect Josep Puig i Cadafalch and is held in the style of Catalan Art Nouveau, the Modernism. The social foundation of the Caixa is housed in an important building from the Modernisme. The industrialist Casimir Casarramona, a pioneer in the use of electrically operated machinery in factories, assigned Josep Puig i Cadafalch to the construction of the factory. Along with Gaudí and Domènech i Montaner, Puig i Cadafalch was as one of the most important architects of the Modernisme, the Catalan art nouveau. In an impressive way, the factory is an example of how the art nouveau combined functionality and aesthetics. Medieval castles inspired Puig i Cadafalch to build the factory with bricks and decorate it with cast-iron ornaments. Back then, the building was a prime example in respect of fire prevention and was long seen as a standard in the matter of labour conditions. In 1913, the building was inaugurated, in 1919 the clothing factory moved out of it. For quite a while it was vacant before being used as a police station from 1940 to 1992. In 1963, the savings bank "la Caixa" had become the new proprietor of the building. In 2002, the Casaramona was reopened as the CaixaForum, the cultural and social centre of the social foundation of the Caixa. The most important aspects of the reconstruction of the building at the foot of the Montjuïc were to maintain the original structure, colour and style, but also to set new trends. The exhibition space comprising 3,000 sq.m. should be flooded with light. The entrance area was designed by the Japanese architect Arata Isozaki. 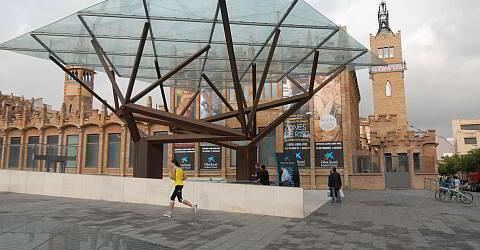 A tree made of steel and glass welcomes the visitors at the CaixaForum. Closed on 1 Jan., 6 Jan. and 25 Dec.